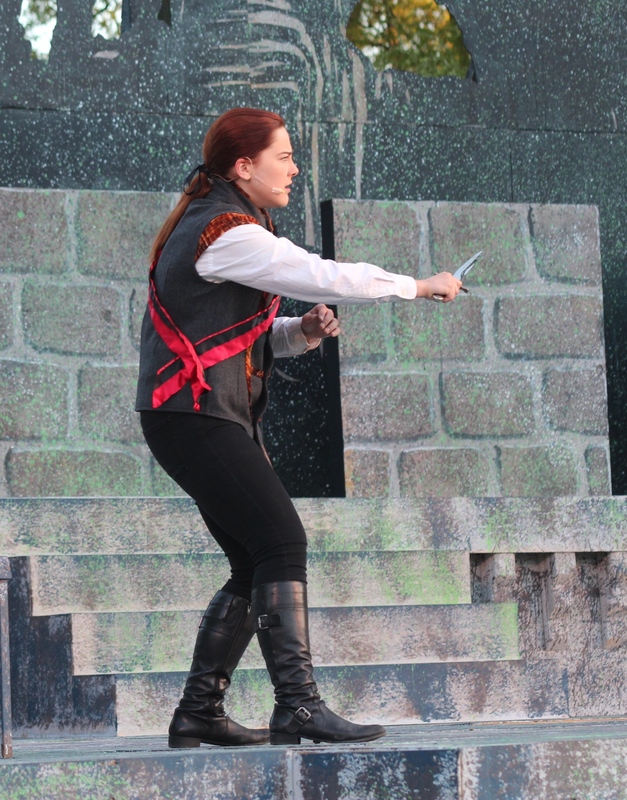 Two of the most memorable theatrical events of 2014 took place in Schiller Park. The first was Actors’ Theatre’s production of Hamlet. Though it garnered the most attention for its offbeat casting of a teenage girl in the title role, what really set the show apart was its overall quality. Every role—from the Danish prince to the lowly gravedigger—was cast and performed to perfection. The second event was the May 30 memorial for actor Carl Novak, who died unexpectedly last spring. I first met Carl several years ago when he approached me during intermission at a local show and said some nice things about my reviews—frank but fair, something along that line. I didn’t yet know who he was other than a familiar face at opening nights, but I appreciated the supportive words. It was only after Carl’s death that I learned he’d said equally supportive things to many people. On Facebook and at the memorial service, people described him as a man who went out of his way to make others feel important and appreciated. Though I don’t share the strong Christian faith that guided Carl, it’s hard for me to think of him without recalling words from the New Testament: “Go and do likewise.” What a world it would be if we all followed his example. Back to business: This being the end of the year, it’s time for me to share my list of the best theatrical performances and productions I saw in 2014. Notice the “I saw.” No one has time to see everything, and I almost certainly missed many worthy contenders. Thanks to everyone who made 2014 a good year to go to the theater. Best Play: Hamlet, Actors’ Theatre. Co-directors John S. Kuhn and Nick Baldasare coaxed incisive performances from the entire cast, starting with Grace Bolander, the high school senior who gave such a brilliant interpretation of the title prince. Runner-up: How We Got On, Available Light Theatre. Best Musical: The Producers, Gallery Players. Director Mark Mann and his crew paid amazing attention to detail while creating a tuneful show with many laugh-out-loud moments. The entire cast performed with spirit, but special commendations are due to supporting actors Doug Joseph (as Roger De Bris, alternating with Stewart Bender) and Brooke Walters (as Swedish secretary Ulla). Runner-up: Always…Patsy Cline, CATCO. Best New Work: Memory Fragments, MadLab. Sam Wallin’s “cyberpunk” mystery constantly shifted between the present and the past, and between physical and virtual reality, but director Andy Batt handled the changes with aplomb. Runner-up: Gallery of Echoes, Shadowbox Live. Best Revised Work: Evo, Shadowbox Live. Stev Guyer’s Evolution was an ambitious but plodding work from the troupe’s early days. The new version, which Guyer revised with help from head writer Jimmy Mak, musical director Matthew Hahn and choreographer Katy Psenicka, was just an ambitious but far more watchable. Best Touring Show: The Book of Mormon, Broadway in Columbus. Only a poor sod with maggots in his scrotum could fail to enjoy this raunchy but warmhearted satire. Worst Trend: musicals with canned accompaniment. CATCO’s production of Dirty Rotten Scoundrels handled the prerecorded soundtrack pretty well, but taped music drained much of the life out of SRO’s The Sound of Music. Besides, musicians need the work! Best Direction: Hamlet, John S. Kuhn and Nick Baldasare, Actors’ Theatre. Every role was handled with such clarity that even Shakespeare buffs probably gained new appreciation of the venerable tragedy. Best Performance, Male: Isaac Nippert, My Name Is Asher Lev, CATCO/Gallery Players. As Asher, Nippert expertly navigated a role that required him to narrate his own tale while playing himself at ages ranging from youngster to adult. Best Performance, Female: Grace Bolander, Hamlet, Actors’ Theatre. Casting a teenage girl as the melancholy Dane might seem like a gimmick, but Bolander gave an impassioned yet witty performance that proved she was simply the best person for the part. Reel Time With Richard Ades Blog at WordPress.com.